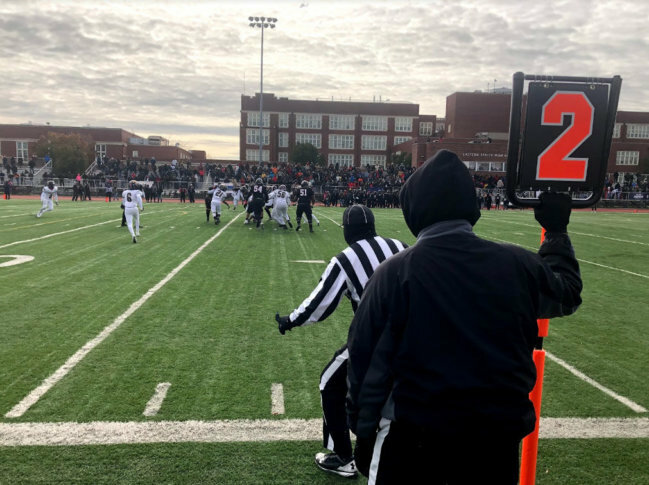 WASHINGTON — Despite a cold Thanksgiving morning, hundreds of faithful high school football fans braved the frigid temperatures for the 49th annual Turkey Bowl. For H.D. Woodson and Ballou high schools’ football teams, the game was a fight for the title of D.C.’s high school champions. With a touchdown in overtime, the H.D. Woodson Warriors came out on top with an 18-12 win over the Ballou Knights. The game’s outcome settles a score for the Warriors that lost to the Knights in last year’s Turkey Bowl. Don Hursey, of Bowie, Maryland, is an H.D. Woodson graduate and said he hasn’t missed a game in 40 years since he played football for the team in 1978. “This is the coldest one I’ve been to, though. It’s normally a little warmer than this,” Hursey said. For many D.C.-area residents, the Turkey Bowl is more than a football game — it’s an important part of Thanksgiving Day festivities. “There are so many people in these stands today who played football in D.C., myself included, who’ve been a part of this tradition and they’re here. It’s almost like a homecoming,” said Ward 7 D.C. Council member Vincent Gray, who is a Dunbar High School graduate. In the stands, it was also a reunion for many former players who, at one time, found themselves on the field in a Turkey Bowl. Danny Johnson, who was a high school wide receiver, was on the field in 2010 and said his Turkey Bowl was very special. “You have homecoming, but this is even bigger than homecoming. It’s like a real family atmosphere, so it’s big for the players and the people in the stands,” Johnson said. In the stands for Ballou, Laquetta Jones cheered on her two sons, who play for the Knights. “It’s great to see the kids come together and just bring the camaraderie together,” Jones said.